My new Deep Value Dividend Growth Portfolio or DVDGP (beating the market by 10% so far) is all about investing in quality dividend payers, at good to great prices, opportunistically when the market becomes extremely bearish on quality income producing assets. While the portfolio's strategy is inherently contrarian, we tend to stick to blue-chip low-risk stocks that are a good choice for conservative income investors, such as retirees (including plenty of dividend aristocrats and kings). However, that doesn't mean that from time to time DVDGP won't take a small and more speculative position in a riskier turnaround story, that for one reason or another has been beaten down to a firesale valuation. This week the portfolio added Qualcomm (QCOM), CVS Health (CVS) and Vodafone (VOD). Let's take a look at why I consider now a great time to open or add to a position in each company, despite obvious risks that have many investors worried they are value/yield traps to avoid. Ultimately the difference between a good deep value stock and a value trap comes down to probabilistic risk assessment, the quality of the management team, and each company's realistic long-term growth potential. While none of these names are "slam dunk, must own, SWAN stocks" I consider each one to be a highly attractive income growth opportunity that is likely to deliver 18+% long-term total returns. Combined with attractive yields that should be sustainable over the long-term, QCOM, CVS, and VOD represent potentially sensational opportunities right now for risk-tolerant investors who size their positions appropriately in a diversified dividend portfolio. Founded in 1985, Qualcomm has spent 34 years pioneering various computer chips including 3G and 4G wireless components that have allowed it obtain over 130,000 current and pending patents. That IP is the cornerstone of its most profitable business Qualcomm Technology Licensing or QTL. The company also has another segment Qualcomm CDMA Technologies or QCT, that designs and develops chips, including for upcoming 5G devices. But while QCT accounts for about 80% of sales QTL accounts for about 80% of profits, thanks to much higher pre-tax margins (58% vs 16%). And keep in mind that due to numerous legal disputes (more on this in the risk section) QTL's margins are actually way down compared their historical levels (operating margins typically run about 85%). Those sky-high margins on licensing are due to Qualcomm's near monopoly on 3G and 4G patents which means that it generally collects between 3% and 5% of smartphone wholesale prices in royalties. That translates into free cash flow (what pays the dividend) margins that typically range from the high 20s to low 30% range. For context, most companies are happy to make 7% FCF margins and semiconductor makers are considered lucky to hit 5%. QCOM's dominance in licensing has allowed it to become one of the most profitable companies in its industry, and indeed all of corporate America. Which is why it's been so generous to shareholders, including over $86 billion in total cash returns via buybacks since 2003 and a rapidly growing dividend that's increased for 15 consecutive years. But former glories are not nearly as important as a company's long-term growth plans. Qualcomm spent much of 2017 and 2018 attempting to acquire Dutch chipmaker NXP Semi in a $44 billion acquisition that ultimately died when China (likely due to the trade war) failed to approve the deal (it was the last required regulatory approval). NXP is a dominant player in the internet of things or IOT, specifically connected cars and Qualcomm believes that 5G and IOT (which it enables) is its best growth runway. So how does Qualcomm plan to keep growing its cash flow and dividends now that it's pretty much given up on transformative mergers (at least for now)? Through three main ways. In the short-term management expects $1 billion in cost cutting in fiscal 2019, combined with a new $30 billion in buyback authorization to help drive incredible FCF/share growth in 2019 and 2020. 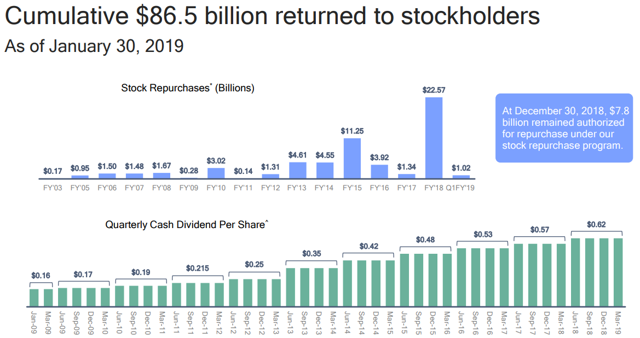 That epic buyback program was announced in July and so far the company has already repurchased $22.2 billion or 74% of the planned amount of shares. For the long-term management is optimistic that its QTC business can drive sustained top and bottom line growth thanks to its strong position in high-end smartphones. And as CEO Steve Mollenkopf explained Qualcomm's Snapdragon 855 smartphone chips and X50 5G modem (capable of "multi-gigabit" download speeds) has "over 100 design wins in development." What's more in 5G IOT chips the company has over 30 more design wins its currently working on. And mind you those are just from 2019's CES in January (the biggest consumer electronics trade show). Essentially QCOM is going back to basics in terms of good hardware design, which is expected to return the company to growth by the end of the year. How big of a growth market could 5G be for the company? Well, management estimates that by next year alone the 5G chip market will generate $100 billion in sales. 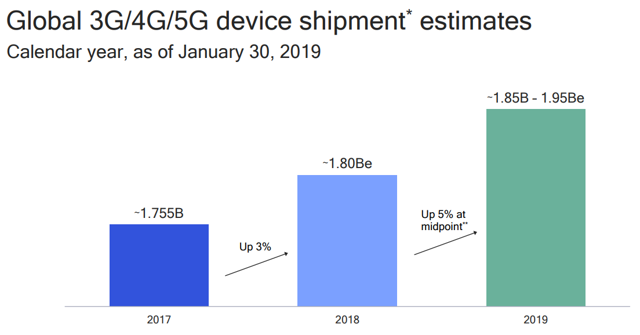 And keep in mind that in the US 5G isn't expected to hit 50% penetration until 2023. Over the long-term 5G chips are going to potentially revolutionize the world's economy, via increasing automation, driverless cars, and the IOT. Qualcomm spent much of 2018 locking up 5G chip contracts with industry heavyweights like Samsung and Alphabet (GOOG). And the company's over $5 billion in annual R&D has been going into ever improved its 5G offerings, and according to IAM Media, QCOM owns 15% of the world's 5G patents. What does this mean for Qualcomm's future growth? Well, the glory days of sensational growth might be over since neither huge sales growth in smartphones nor a far smaller patent lead in 5G relative to 3G and 4G will allow Qualcomm to drive long-term double-digit sales growth. However, analysts still expect about 4% long-term sales growth driven by about 3% QTC growth and high single-digit QTL growth. That translates into about 9% to 10% growth in EPS and FCF/share which is more than enough to make QCOM a great investment at this price. But of course, a company with so much to like doesn't become this undervalued without plenty of risks to consider before you buy it. There are plenty of negatives that have hammered QCOM's shares in the past 12 months (and weighed on the price for years). That's why in a recent short report Kerrisdale Capital (who is short the stock) said that the company is "teetering on the brink of disaster" and the QTL business is "living on borrowed time." How bad does Kerrisdale think QCOM might fall? Try a 60% decline to $21 per share. Indeed QTL has become a major headache for Qualcomm due to various governments fining and suing the company over anti-competitive licensing practices. Those include abusing its virtual 3G and 4G patent monopoly to decrease competition for global mobile chips. In 2015 Chinese regulators fined QCOM $975 million and forced it to lower its 3% to 5% royalty from 100% to 65% of a phone's wholesale cost. In 2016 South Korea’s Fair Trade Commission fined the company $873 million for violating its competition laws. In 2017 Taiwan's Fair Trade Commission fined Qualcomm $773 million over its IP royalty structure. In 2018 the EU fined QCOM $1.2 billion over its use of rebate payments to Apple to try to block the phone maker from using competitor products. This fine is currently being appealed. And of course, we can't forget that Apple has been locked in a heated legal fight with QCOM for two years now, and withholding royalty payments. The latest regulatory headwind is an FTC lawsuit brought by the US government which recent court documents show has some strong evidence against the company's past licensing practices. "we absolutely cannot give a chip supplier a full license to our IP with pass-through rights to his customers as that would have the potential of severely impacting our subscriber licensing program." That quote from a court filing pertains to Qualcomm avoiding licensing to a rival chip maker for fear of hurting its cash cow QTL business. Essentially the US legal system is trying to decide on the legality of the company's "no license, no chips" practices in which to buy its chips company's had to agree to QCOM's industry-leading royalty terms. So things are looking pretty shaky for QCOM in terms of legal risks right now which is why the Motley Fool's Evan Niu recently said: "if these legal battles go against them, it's just going to get a lot worse." With the trial now wrapped up, investors can only hope that management can reach a settlement with the FTC that doesn't result in a worst case scenario which is what the company has been trying to do. So with the company facing such high legal risk why am I buying QCOM? Well because it's not clear cut that QTL is on its death bed. Here's what Morningstar's Abhinav Davuluri has said about the FTC trial and Qualcomm's legal fight with Apple. Don't get me wrong, there is a lot of risk to QTL right now but the nature of contrarian deep value investing is betting that the worst case scenario won't happen and that's what I'm counting on with my QCOM purchase (and rec for risk-tolerant investors). But we can't forget that outside of regulatory/legal risks QCOM also faces some other headwinds. 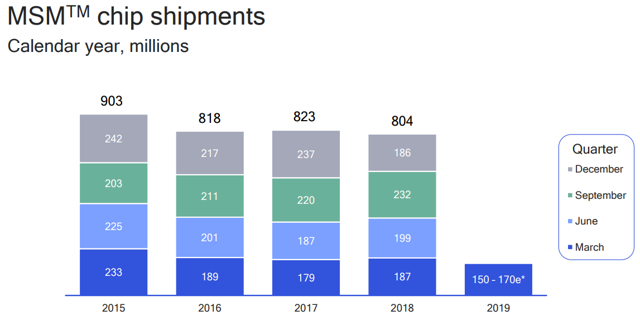 Despite rising global device sales Qualcomm's chip volumes have been falling over the years as more large phone makers bring their chip development in-house (Samsung, Apple, Huawei). And since Qualcomm's 5G tech lead is nowhere near as strong as it was in 3G and 4G there is no guarantee that its QTC business will, in fact, grow as fast as analysts expect. And if other companies (most notably Samsung) manage to out-innovate it in terms of 5G tech and patents, then QTL sales and profit growth might also disappoint. But despite all these headwinds, the reason I'm buying and recommending QCOM right now can be summarized in one chart. 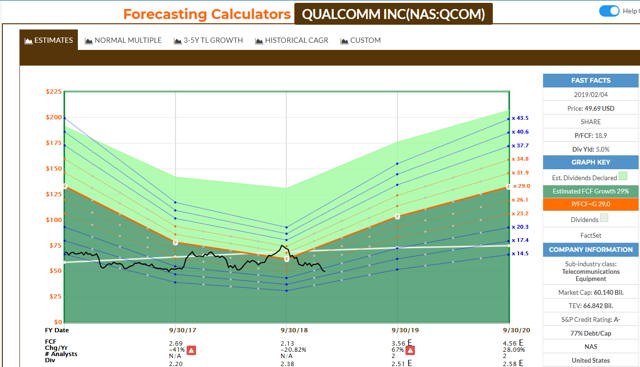 Despite its numerous struggles over the years, including a weakening of the QTL cash cow business model, Qualcomm keeps returning to its five-year average yield of 3.5%. If that happens again (2019 legal resolutions being the most likely catalyst) then investors could see a 40% capital gain within a 12 to 18 months period. All while locking in a safe (barring worst case FTC trial result) 5% dividend that will likely grow steadily over time, though at a high single-digit rate. 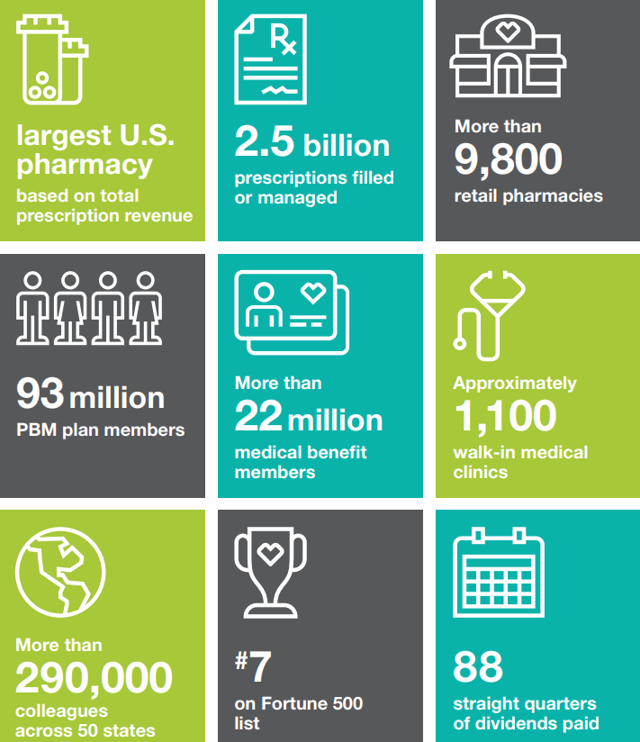 CVS Healthcare began as a pharmacy chain but has expanded into one of the nation's pharmacy benefit managers or PBMs. Last year acquired health insurance giant Aetna in a $78 billion Aetna mega-merger (including debt) which closed on November 28th, 2018. 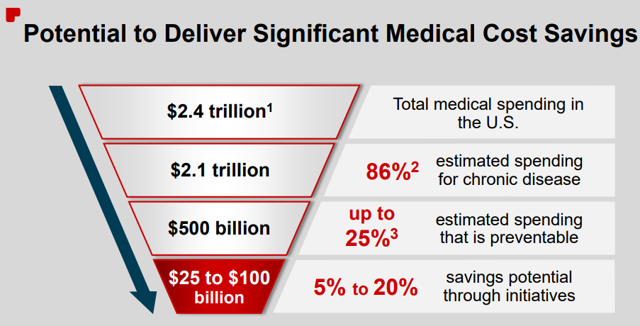 70% of revenue came from pharmaceuticals and PBM services (pre-Aetna merger). 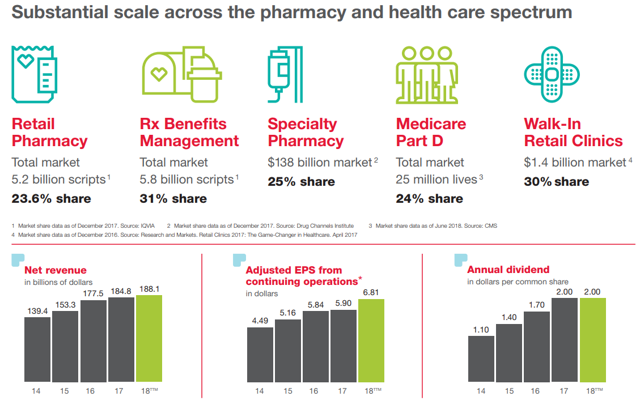 This means that CVS is now one of the largest healthcare companies in America, and vertically integrated, which means even better economies of scale (the cost of processing an additional prescription or healthcare claim is virtually zero thus boosting margins as volumes increase). The closing of that deal means that not only does CVS has dominant market share in all its key business segments, but that in 2019 it should have no trouble growing its top and bottom lines as it's done steadily over the years. The dividend is frozen for now (though very safe) while management focuses on digesting Aetna and deleveraging. 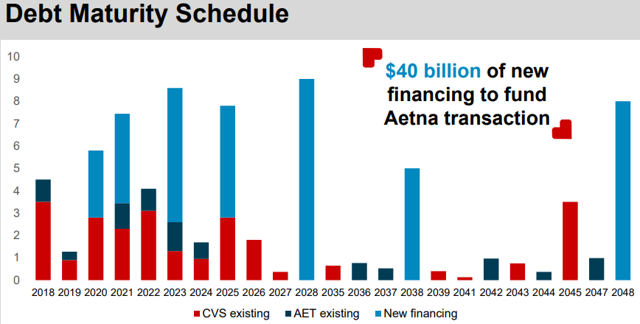 The CVS/Aetna merger is designed to be a strategic merger that allows CVS to get ahead of the cost-cutting curve, in which politicians and companies are desperate to improve efficiency and reduce unnecessary waste. CVS hopes to use the industry's best economies of scale to not just help achieve that $25 to $100 billion worth of annual cost savings, but capture a small piece of that in billions of additional profits. That includes through investments in technology at all levels of the company to minimize pharmacy mistakes, and improve care via minute clinics to reduce costly patient readmissions to hospitals. Management expects to achieve over $750 million in cost synergies by the end of year two (2020). In addition to the standard elimination of overlapping administrative functions, CVS expects to achieve those cost-cutting goals via simplifying the drug formulary and health plans offered compared to when CVS and Aetna were stand-alone companies. That alone would boost profitability but so too will the fact that Aetna is a much more profitable business than CVS, with about double the net margins in 2017. 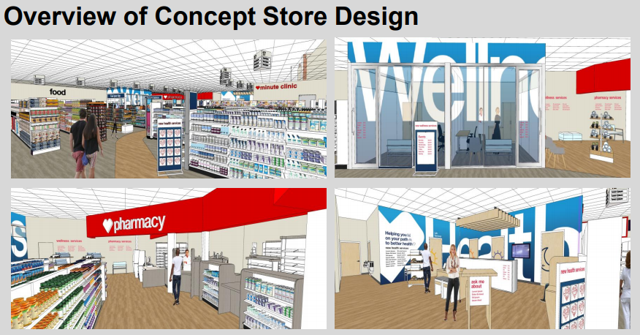 Further helping future profitability is the fact that CVS intends to repurpose an increasing number of its nearly 10,000 pharmacies in the coming years to incorporate more of its successful minute clinics and turns its stores into healthcare hubs. 20% of underperforming retail space will be switched over to healthcare clinics, which are not just more useful to customers (wider moat) but also more profitable. Why should investors have confidence that the Aetna acquisition will work out? Well because CVS's last big strategic shift, breaking into the PBM industry in 2006 with its $21 billion acquisition of Caremark was not just successful, but ultimately led to CVS being able to grow its dividend 925% over the past 12 years. 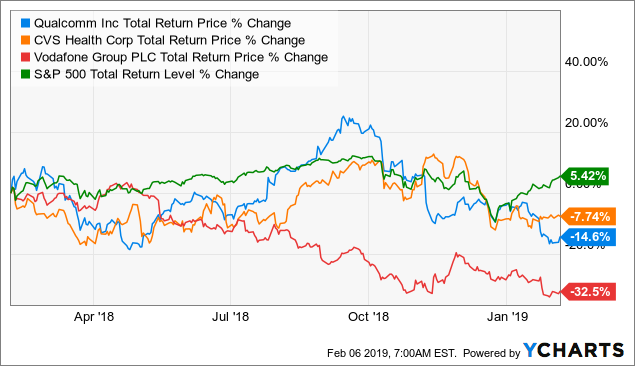 Past success is no guarantee of future results, of course, however, CVS became a great dividend growth stock precisely because it's been one of the most adaptable companies in its industries, including via strategic M&A. Morningstar, which has historically had some of the most conservative growth assumptions on Wall Street, expects CVS to deliver 11% and 15% CAGR growth in revenue and operating profits over the next five years. What does the potentially mean for CVS investors? Well according to Factset research analysts currently expect CVS's FCF/share to grow at 11.3% CAGR over the next half-decade. From today's low price/forward FCF ratio if CVS succeeds in integrating Aetna and hits its growth targets then its cash flow multiple could expand from its currently low 8.0 to about 15 (10-year average) in the coming years. That would translate into over 23% CAGR total returns for investors, who would be enjoying a safe yield that's over 50% higher than the market's. Sounds great right? But before you run out and load up on CVS first remember why the shares are so beaten down right now, which is a rather complex risk profile. CVS took on $40 billion of debt to buy Aetna (the largest bond sale in two years), at an average interest rate of 4.2%. That giant pile of extra debt is why Moody's downgraded the company one notch (from A- S&P equivalent to BBB+) and has a negative outlook for the company. S&P also downgraded the company's credit rating to BBB following news of the deal. Since a strong balance sheet is essential to maintaining good long-term financial flexibility, low borrowing costs and a safe dividend debt repayment is going to have to take priority over payout growth for now. CVS's debt reduction plan includes suspending the buyback program and freezing the dividend at current levels. It also won't be making any more M&A deals for the foreseeable future. 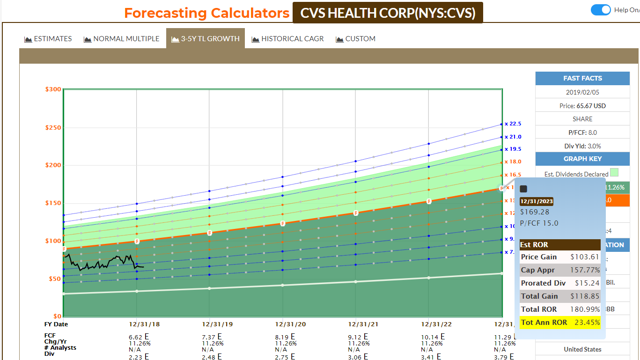 Analysts currently expect CVS's dividend to remain frozen until 2021, which I consider a reasonable estimate. But while it's bad enough that CVS's mega-deal broke a 14-year dividend growth streak we can't forget that the company faces plenty of other core challenges to its business model. That includes less generic drug rollouts in 2019, ongoing pricing pressure from insurance companies and major medical companies (who are also consolidating to maximize scale and squeeze its margins) and a lack of earnings boosting power from tax reform that won't be repeated this year. In addition, converting pharmacies into healthcare hubs is going to ultimately cost several billion, which means higher capex in the coming years that will keep FCF growth muted. And of course, any healthcare investor has to remember that regulatory risk is an everpresent consideration as well. On January 31st, 2019 Department of Health and Human Services proposed a new rule banning backdoor drug rebates between drug companies and pharmacy benefit managers (PBMs), Part D plans and Medicaid managed care organizations. The bad news is that, as with all major government healthcare regulatory changes, there could be knock-on effects and unintended consequences that could indeed hit CVS's bottom line. And lest we forget the biggest risk of all is longer-term and also political. Most of the 2020 Democrat candidates have endorsed Bernie Sander's "Medicare-for-All" single payer proposal which could devastate private health insurance in the US by potentially banning it. The point is that while healthcare is a recession-resistant defensive sector in the US, and healthcare companies like CVS have historically made excellent long-term dividend growth investments, anyone considering buying this stock needs to be well aware of all the ways the investment thesis could break. Vodafone was founded in 1984 and is a UK company that reports results in Euros but operates internationally in 25 countries on four continents. Through a wide array of joint ventures, this formerly pure-play wireless operator has turned itself into a global integrated telecom giant. That includes obtaining about 28% of revenue from long-term contracts with enterprise (corporate) clients, which helps with maintaining more stable cash flow over time to support that mouthwatering dividend. Vodafone has a total of 275 million customers (excluding joint ventures) which gives is massive economies of scale and a narrow moat (telecom is a highly regulated and competitive industry with few wide moat businesses). The Kabel Deutschland deal gave Vodafone the fastest broadband network in Germany, Europe's largest and typically fastest growing economy. The Liberty Global deal is the biggest M&A attempt by current CEO Nick Read, who took over the top job in October 2018. Before that, he was CFO and prior to that CEO of Vodafone's Africa, Middle East, and Asia-Pacific operations. 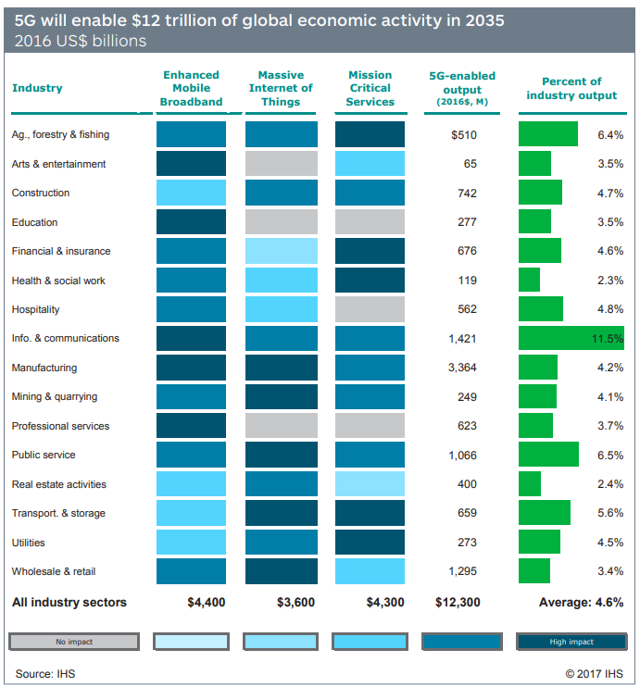 He leads a team of executives that Morningstar's Allan Nichols considers about average for the industry in terms of operational execution and capital allocation. For context AT&T's (T) management team is rated "poor" on these fronts, an assessment I agree with and why I don't own that telecom despite its low valuation. Management plans to expand Liberty Global's broadband network by 25 million households by 2022, which would mean it has the potential to service 67% of households in those markets within five years. More importantly, this deal represents a good deal for Vodafone with the company paying just 10.9 times 2019's forward EBITDA and 8.6 times including expected synergies. Ultimately that translates into the deal being immediately accretive to FCF/share starting in year one, and accretive by double-digits by the end of year three which will help enhance the dividend safety and the company's deleveraging ability. Between 2013 and 2016 the company also embarked on a costly three-year investment effort called Project Spring (part of a five year $92 billion capex binge) designed to better extract synergies from its numerous acquisitions over the years, improve its telecom networks, and increase cross-selling of various business products to both retail and enterprise clients. Projects Spring helped to improve Vodafone's networks including wireless, cable and broadband. Today Vodafone's networks are typically rated in the top two of companies in each market, allowing it to compete more effectively on price to win market share from incumbent rivals (in nearly all markets it's #1 or #2 in market share). 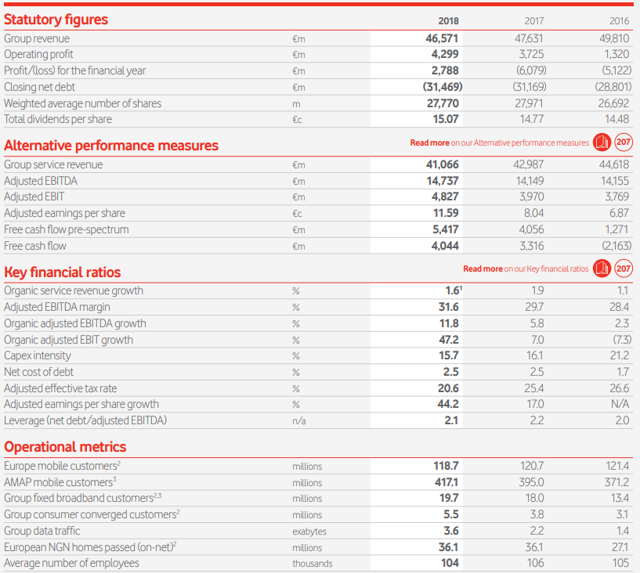 While Project Spring's execution hasn't been perfect (given the incredible complexity of this company's global operations) what makes me willing to buy Vodafone is the solid growth in profits and cash flow. Similarly, the dividend (denominated in the home currency of the Euro) has been slowly rising over time though it's now been frozen as management works to pay down substantial debt taken on due to recent acquisitions (see risk section). Vodafone is hardly up to the quality standards of Verizon (VZ) but it's making good progress in its businesses including adding 1.3 million broadband customers in 2018 and growing its enterprise revenue by 2.1%. And while the Liberty Global acquisition poses a lot of risks (including of not being approved), if management can deliver on the $8.5 billion in cost and revenue synergies (not guaranteed by any means) then that deal should eventually help drive much stronger cash flow growth. Which in turn would allow VOD to achieve its long-term leverage targets, and not just maintain the current dividend, but eventually grow it at a modest pace. While the entrance of French wireless company Iliad into Italy's market in early 2018 (which is causing a price war) is expected to ding VOD's margins in 2019, ultimately analysts expect margin and ROIC expansion in 2020 and beyond. In fact, despite a weak 2019, according to FactSet Research analysts currently expect VOD's FCF/share (what pays the dividend) to grow 9.3% CAGR over the next five years. 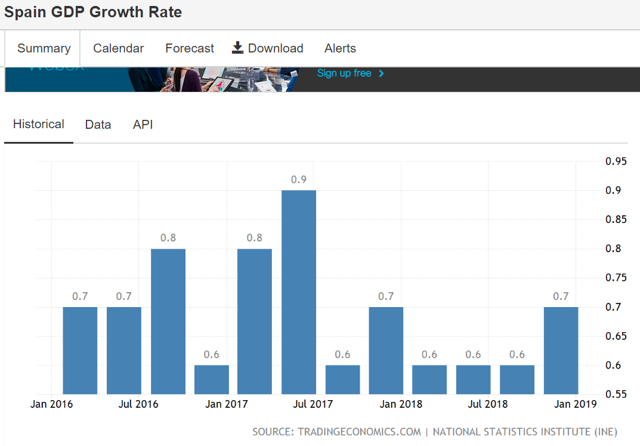 That's above the 20-year growth rate of 5.6% and I'm personally less bullish expecting just 4.7% long-term free cash flow growth. But given the dirt cheap valuation (price to tangible book value of 2.0 vs a 13-year median of 3.0 and 4.8 times free cash flow) even roughly 5% long-term cash flow growth should be enough to maintain the current payout, and eventually, allow it to return to modest growth. It would also likely mean significant multiple expansion that could make Vodafone a rockstar stock in terms of capital gains. 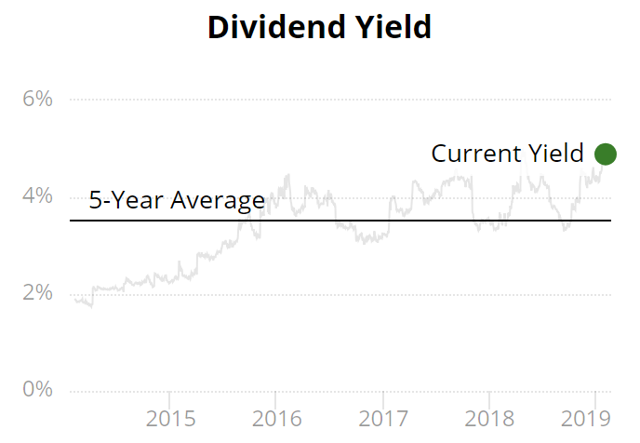 But while that expansion isn't likely until 2020 or beyond (when margins and ROIC start improving again), in the meantime VOD's 9.4% yield combined with a DRIP means that investors would enjoy 10.3% total returns from dividends alone. Being paid double-digit returns in cash while waiting for a thesis to play out is enough to convince me to take a small stake in the company. That's especially true given that VOD's 10-year average price/FCF has been 10.3 and if the cash flow multiple were to return to that historical norm over the next five years income investors would be potentially looking at a 32% CAGR total return. Basically, VOD represents the classic deep value opportunity, a high-yield telecom blue-chip that's offering risk-tolerant investors the potential for hyper growth tech stock returns. 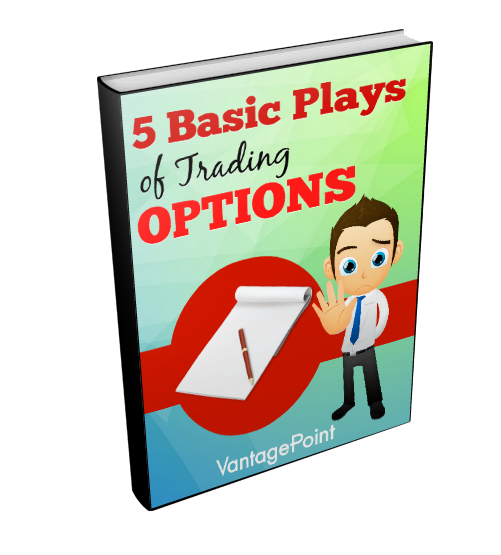 But before you run out and buy the stock first you need to understand its complex risk profile. 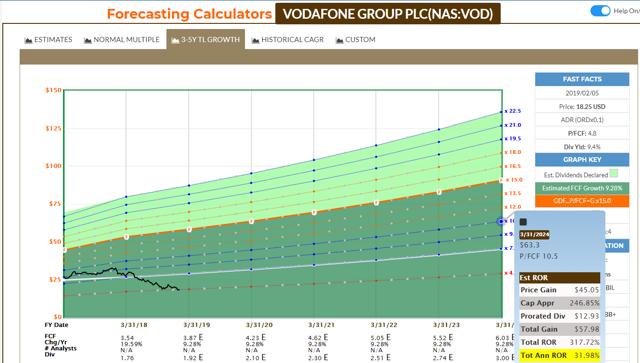 One of the biggest worries Vodafone investors have (thus the reason for that sky-high yield) is the dividend's safety. Well, there's good and bad news on that front. Vodafone currently believes it can maintain the current dividend while it executes on its long-term growth and deleveraging plan. And it eventually plans to grow the payout (though slowly) as it reaches its targets and goals. Management's net leverage target is 2.5 to 3.0 which would be within safe levels for this industry. However, US investors can't forget that due to Vodafone reporting financials in Euros, and operating in so many foreign countries, there is a lot of currency risk involved. When combined with the semi-annual (including interim dividend) nature of the payout policy that means that your effective dividends will be somewhat variable. While currency fluctuation tends to cancel out over time anyone who needs quarterly and rock steady dividends to pay the bills (like retirees) should not own the stock. I can't stress this enough, Vodafone should only be part of a well-diversified portfolio, with its specific position sized according to its relatively high (for a telecom) risk profile. That risk profile includes the standard challenges of telecom, which is a highly capital intensive, regulated, and leveraged industry. Companies are constantly having to invest a ton of cash into improving, maintaining, and expanding their infrastructure, and that will never change. Roughly once a decade new telecom standards (3G, 4G, 5G) come out and the mega investment cycle begins anew. This means that telecom company's generally don't enjoy strong returns on invested capital (9% is considered good in this industry). Vodafone's ROIC over the past 12 months has been just 4% which is far below levels investors should be happy with. The reason I am buying the company is because that metric has markedly improved (from 1% in 2016) as the company integrates some of its more recent (and smarter) acquisitions. But speaking of acquisitions, it's important to remember that due to the slow-growing nature of this business (in developed and saturated markets), most telecoms have to grow through M&A. That adds to the industry's risk profile since, according to Harvard Business Review, 70% to 90% of mergers fail to deliver long-term shareholder value. That is for several reasons, including overpaying, struggles to integrate assets and corporate cultures, and general execution risk. Vodafone's historically weak (but now improving) ROIC is due to its fair share of poor M&A over the years. That was mostly under previous management (the three CEOs before this one) but required a staggering $91 billion in write-downs since 2006. The good news is that the current management team is made up of executives that have been acquired from some of Vodafone's smarter acquisitions. Combined with the new more focused growth (including better M&A targets) strategy that is expected to result in a significant margin and ROIC improvement in the coming years. But Vodafone's latest mega-merger, while one I consider to be done at a fair price and be strategically sound, might not even be approved. Morningstar estimates a slightly less than 50% chance of regulatory approval which means that investors need to be prepared for the potential benefits of the deal to never materialize. Finally, we can't forget that management's claims that the dividend can be maintained at current levels while simultaneously deleveraging is dependent on continued good business conditions in important markets such as Italy and Spain (about 25% of EBITDA). However, in those markets, Vodafone is now facing stiffer competition as well as weakening economies (Italy is now officially in a recession). Spain, while not contracting, isn't far from it. 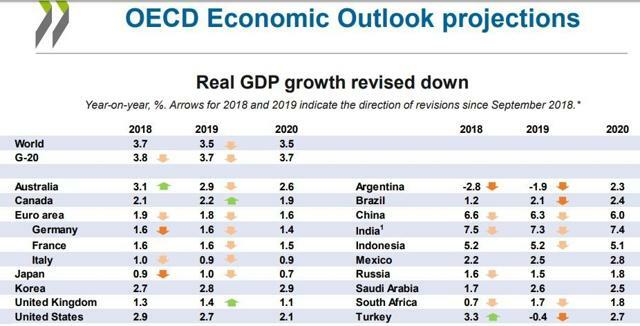 This shows that current forecasts for slowing European economic growth might come in below even very modest expectations, both for 2019 and 2020. Ultimately I consider Vodafone's business model to be low risk enough to own, but the company itself is a speculative deep value buy that requires sizing your position accordingly. I personally recommend capping it at 5% or less of your diversified income portfolio. 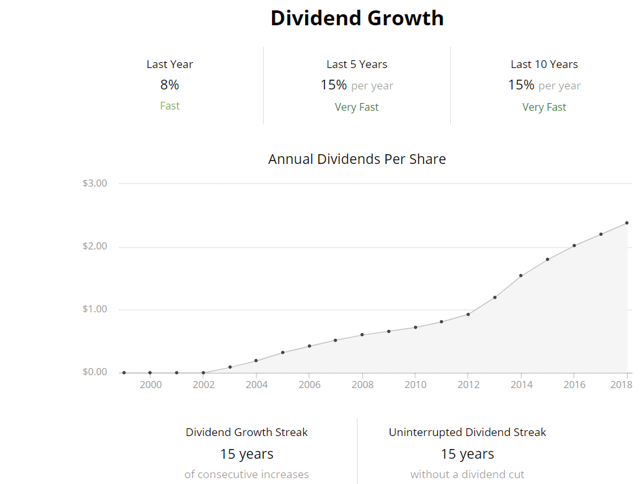 The ultimate thing I look at when deciding on whether or not to buy a company (or recommend it to readers) is the dividend profile. 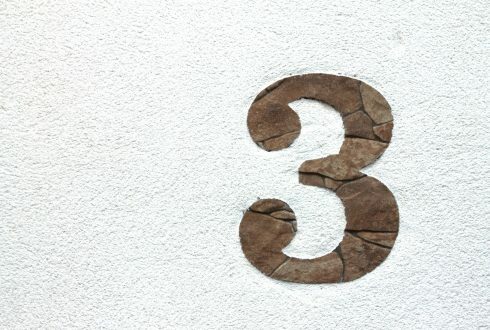 That consists of three parts, yield, safety, and long-term growth potential. When combined with valuation, this is what tends to drive total returns and my buy/rec decisions. All three of these deep value stocks offer an attractive yield relative to the market, though obviously, Vodafone's 9.4% dividend stands out. But more important than the current yield is safety. I'm not interested in owning or recommending yield traps that will have to cut their payouts in the future. So you might be wondering "what the heck! QCOM has a 191% FCF payout ratio!" Indeed at first glance, Simply Safe Dividends' (where I'm an analyst covering over 200 companies per year) safety rating of 65/100 on QCOM might seem insane given that payout ratio. However, that TTM result is due to a combination of transitory effects that are likely to disappear soon. That includes a $2 billion breakup fee over the NXP deal being scuttled, and QTL licensing revenue being withheld (which is likely to come flooding back later in 2019). But when those temporary setbacks are removed this year, and combined with epic buybacks (to be completed this year) and $1 billion in cost-cutting, as well as a return to organic sales growth in late 2019, analysts expect QCOM's FCF/share to more than double over the next two years. 114% FCF/share growth, while far from guaranteed to happen, would reduce the payout ratio to a sustainable and safe 57%. The other half of the dividend safety equation is debt levels. Few deep value stocks have pristine balance sheets and indeed that's the case here. While QCOM's net leverage ratio is very low, its interest coverage ratio is not nearly as high as I'd like to see. This is due to the debt taken on to complete the mega buybacks (lined up for the NXP deal that fell apart). Similarly, Vodafone and CVS's debt levels are high thanks to recent acquisitions. But the reason I'm not waived off by these debt levels is that each company has outlined a clear plan for long-term deleveraging which the bond markets and credit rating agencies have confidence in. That's why each company enjoys a strong investment credit rating and low borrowing costs. In the case of QCOM and CVS, those borrowing costs are far below their returns on invested capital while VOD's will be starting in 2020 if analysts are right about its margins' trajectory. As for long-term dividend growth eventually, all these company's should start growing their dividends again, once their payout ratios are at sustainable levels and management hits their long-term leverage targets. The pace of dividend growth can be expected to track FCF/share growth which is ultimately what drives share prices over time. That combination of yield plus long-term growth potential should deliver at least 14% total returns for each stock, even if their valuations never improve. That's compared to the S&P 500's historical total return of 9.1% CAGR, showing that each of these deeply out of favor companies has strong market-beating return potential. But in reality as long as each company delivers on its plans then QCOM, CVS and VOD's valuations are likely to soar, which means total returns over the next five to years that could top 20%, and possibly quadruple the returns of the S&P 500 over the coming years (according to most analysts' market return estimates). No company becomes a deep value stock without losing to the market, and badly. That's certainly the case with QCOM, CVS, and VOD. But that's why they are deep value stocks because CVS and VOD are now trading at ridiculously low price to FCF multiples that imply zero long-term growth or even negative growth. QCOM's FCF multiple doesn't appear to be offering any historical discount though it does imply slower long-term growth than analysts currently expect. But here's why I consider QCOM a great bargain. That's based on my favorite valuation method dividend yield theory or DYT. Since 1966 this is the ONLY valuation/investing strategy that asset manager/newsletter publisher Investment Quality Trends has used. The result has been decades of beating the market by 10% with 10% lower volatility to boot. Less than 7% of mutual fund managers can even match the S&P 500 over 15 years much less beat it by 10% over 30. So my love of DYT is not based on personal preference but on some excellent historical results. DYT simply compares a stock's yield to its historical norm. Unless the thesis breaks, the yield will tend to return to a historical average that approximates fair value (as we saw earlier with QCOM). In this case, DYT is telling me that each of these stocks, whose long-term fundamental prospects appear sound, are trading at between 28% and 40% discounts to fair value. That massive potential upside, spaced out over five to 10 years, results in valuation boosts so largely that these companies could beat the S&P 500's future returns on multiple expansion alone. Add in yield and long-term FCF growth (which is ultimately what share prices track) and that's how I get my long-term valuation-adjusted total return estimates (historical margin of error 20%). But in case price to FCF or DYT isn't your style and you desire some further confirmation of these company's deeply discounted nature let's turn to the conservative analysts at Morningstar and their long-term discounted free cash flow models. Remember that Morningstar is 100% long-term fundamental focused and famous for assuming lower growth than other analysts or even management itself. Morningstar might not agree exactly with my DYT based valuation estimates but on QCOM it's nearly identical, lower on CVS and higher on VOD. But the point is Morningstar is calling all these companies strong buys or better, thanks to incredible upside potential. Of course, Morningstar isn't God, and its analysts aren't psychic or infallible. But I can affirm that the company's valuation estimates on each company appear reasonable based on their investment thesis and my own research. And ultimately I consider Morningstar's fair value estimates far superior to the 12-month price targets most sell-side Wall Street analysts peddle which are mostly based on speculation concerning short-term sentiment that no one can predict with accuracy. Don't get me wrong, I'm not saying Qualcomm, CVS or Vodafone are "must own" stocks for all income portfolios. These are classic deep value plays right now, with mouthwatering valuations, huge return potential but also plenty of risks. Deep value is an inherently contrarian and challenging investment strategy where you have to carefully weigh the probabilistic risks each company faces against their strengths and realistic growth possibilities. If your future assumptions prove wrong, then a company's investment thesis can break and a deep value stock can become a value trap, with a share price that languishes for years or possibly even goes to zero. However, with QCOM, CVS and VOD, I'm confident that each company's fundamentals, current management quality, and long-term outlook are strong enough to warrant a small investment from risk-tolerant deep value investors. That's because they each offer a high enough margin of safety and attractive dividend that the risk of a permanent loss of capital is far less than their toilet share prices might indicate. This is why DVDGP has taken initial positions in all three companies and will continue to carefully monitor their outlooks and add more each month as long as their thesis holds up and they remain at target yield or better.